Has anyone seen Hustle on Viceland? It follows entrepreneur John Henry who goes around NYC helping really small businesses get over a hump. On a recent episode, he worked with a Brooklyn-based food court vendor that sells donuts called Cuzin's Duzin. The owners told the camera that they were the fastest growing franchise in franchise history but John Henry tells them that's not even remotely true because they only have 2 locations open despite being in business for an astounding 25 years. What follows is Henry expanding their thinking, advising them on how to perfect their branding and customer experience, and teaching them to think more like businessmen rather than donut makers. At the end of the show, he lands them an interview with the Barclays Center (home of the Brooklyn Nets) to possibly secure a trial-run food vendor opportunity. They kind of bomb the interview but are still given the chance to set up shop there for 5 events, thanks to a program the Barclays Center says they are running for local businesses. If the trial goes well, there is the possibility of a long term contract with the arena. When the show is over it says that the Barclays Center gave them one extra day, for a total trial period of 6 events and that they were "in talks" for something more permanent. I got the impression that "in talks" was a phony way of putting a positive spin just for TV on what probably did not turn into anything more. 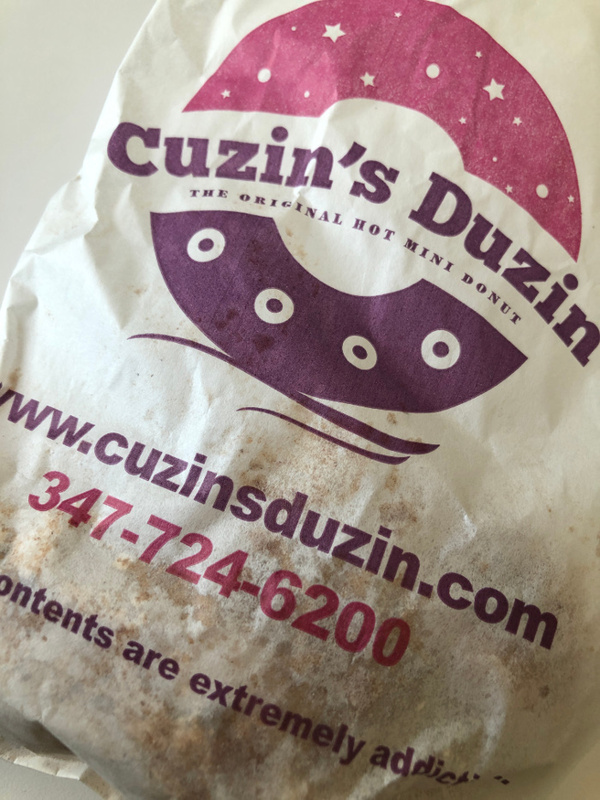 Thanks to the fact that I work only a few blocks from Cuzin's Duzin's main location at the food court in the City Point Mall, also known as the DeKalb Market, I was able to find out what actually happened for myself. I went there earlier this week and talked to an employee about the show and as it turns out they successfully negotiated a long term deal with the Barclays Center to sell their donuts there. The show didn't exaggerate it at all. Additionally, I am told that the episode resonated with so many viewers that they are getting calls from all over the country from people interested in becoming a franchisee of Cuzin's Duzin. Even though they were not polished business people on the show, the two owners came across as passionate about their craft and the donuts looked really delicious. I bought some myself to-go and didn't think to snap a photo until I was almost finished with the bag. It will be interesting to see if they are successfully able to franchise their business, in part because of their appearance on TV. Hustle is similar to CNBC's The Profit except the businesses are smaller and the challenges more fundamental. Henry does not offer to invest in the businesses like Marcus Lemonis does on his show, but Henry is a partner in a local VC fund called Harlem Capital so who knows if any investing is happening behind the scenes. I didn't ask the guy at Cuzin's Duzin if Henry invested. Were they the fastest growing franchise in franchise history? No they were not, but thanks to a TV show, they may actually end up becoming a legitimate franchisor. I watch a little Viceland but I have not heard of this show. Two locations in 25 years... they definitely care about quality doughnuts and not money.